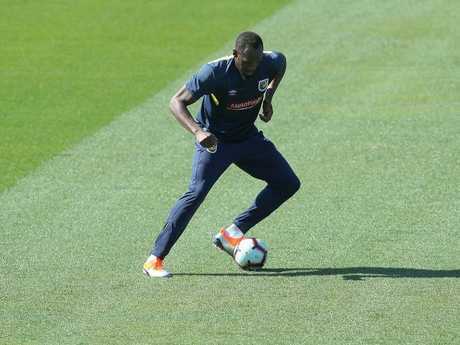 Usain Bolt had his first trot with the Mariners. 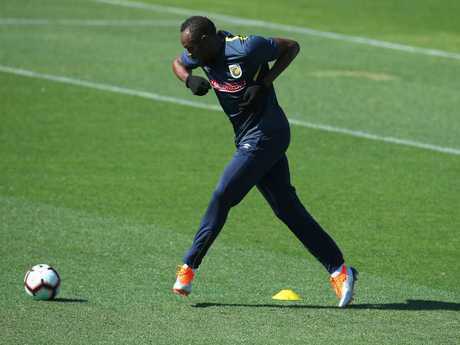 USAIN Bolt has officially started his attempt to secure an A-League contract, walking onto Central Coast Stadium in to strut his stuff. 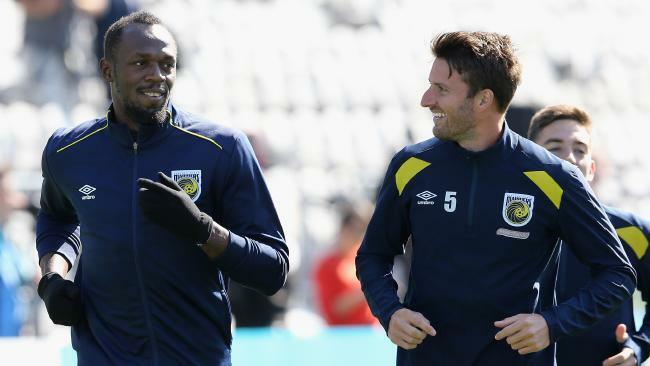 Bolt, who arrived in Australia on Saturday, enjoyed a brief training session with the Central Coast Mariners on Tuesday morning. A 15-minute passing drill was coach Mike Mulvey's first chance to judge the Jamaican sprint superstar's football skills, and he showed some nice touches in a light workout that lasted less than an hour. Speaking after the brief run, Bolt said he fared pretty well for day one of training, which is always the toughest test no matter what sport you're in. "It's just like track and field, the first day of training's always the roughest one, but it felt OK," Bolt said. "I'm not setting myself any targets, I'm just going to put in the work. "I don't know what to expect so I'm just here to push myself, learn as much as possible. "For me it's a blank slate. I'm here to learn and get better, that's my focus." Usain Bolt traded the track for the football pitch. Bolt, who retired from athletics just over a year ago, said although his ultimate goal is obviously to win a contract, he's not setting the bar too high at this stage in his football journey, determined to first get his fitness up then go from there. He also said his temperament and understanding of the game are his biggest attributes, in addition to his speed, and he's determined to prove the naysayers wrong. "I've expressed that I'm OK on the wing, I'm good at centre forward but at the end of the day he (the coach) will tell me what formation and where I'll play. "I don't want to be treated as the world's fastest man, I want to be treated as a footballer because that's what I want to be. Usain Bolt favoured his left foot in his first run with the Mariners. Asked about the challenge of getting his body in the right condition to play the round-ball game rather than sprint 100m, Bolt said he thinks everything will be "relatively easy" once his fitness reaches the level it needs to be at. "Today was good, we're taking it a step at a time, working on fitness, level by level, day by day and then I will push myself," he said. "As long as you get fit in football it's relatively easy. That's how I look at it, I don't know yet. "I've seen as long as you are fit it's relatively easy with the running. As long as I get my body in shape and get some mileage (into my legs) I should be fine." The renowned party boy said although he's keen to enjoy the lifestyle Down Under, performing on the pitch is his No. 1 priority and he's adamant he will "respect the rules". Bolt gave all the right answers, showing he'll be a class act off the pitch if he does gain a call-up. He was respectful and humble - not exactly a trait you'd associate with the Jamaican in his track career - and repeatedly acknowledged the onus was on him to prove he was deserving of a contract. The eight-time Olympic gold medallist said he is "really appreciative of everything the Mariners have done" and promised to always be approachable for the supporters. Bolt has previously trained with clubs in Germany, South Africa and Norway without being offered a contract.